Germanic Club Infantry are fierce and aggressive warriors, though lacking in discipline like most Germanic warriors because their sense of honor and bravery makes them all too eager to get into the fray. They are most effective when deployed against armored units. Sloxonez, whose name can also mean "Butchers" or "Mowers" are Germanic warriors who specifically choose a cudgel for close combat in order to cause massive and deadly blunt force trauma. 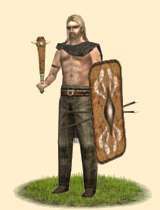 Even if they might not be able afford metal weapons of higher status, Germanic warriors are typically able to make effective arms quickly from any readily available materials. By shaping heavy boughs of oak and inserting bone spikes, this special weapon can be used to maim both armored and unarmored foes alike. Cudgels are cheap, easy to make, and replaceable on campaign, while also being able to smash or punch through armor. Although this weapon may seem primitive to untrained eyes, against armored opponents it is more effective than any other at disposal. Historically, the Germanic tribes quickly realized they naturally lacked the resources required to outfit their men with the armor seen in surrounding societies and found themselves often resorting to weapons with the specific purpose of crushing armor in order to achieve victory over better equipped foes. This worked with a great deal of success as seen by use of these warriors by the Roman Army in their auxilia, depicted on Trajan's Column as possessing swords but choosing to wield clubs. These light armored club warriors were recorded to have taken down units of the feared and notoriously lethal kataphraktoi.